Color(s) Shown: earth-colored tiger print only! This soft-as-a-kitten nomad duster will make you feel like you've just stepped out of the desert into a lush jungle oasis! 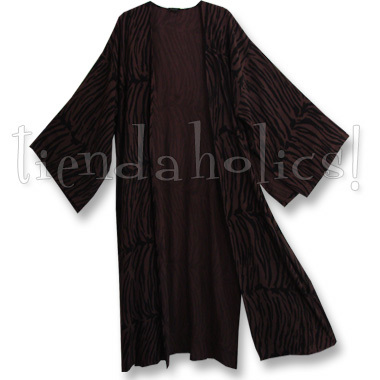 It's in black tiger print susti, a specialty fabric, dyed a deep earthy brown with fabulous results! Be fierce and grr-gorgeous every day... WHY NOT?